There, I made one--a casserole. For those of you who know me, go ahead and pick yourself off the floor. For those of you who do not know me, you now know that I have an aversion to the dish called casserole. O.K., maybe not the dish, but definitely the word. It just reminds me of church basement potlucks where people bring in a wide variety of casseroles that all have the same ingredients. And you know what I am talking about--mayonnaise, cream of mushroom soup, cream of chicken soup, crushed crackers, and even cornflakes. Sorry if I am offending anyone, but that is just not my thing. What is my thing is this recipe. I was looking for a different recipe to use up white corn tortillas and some leftover chicken. 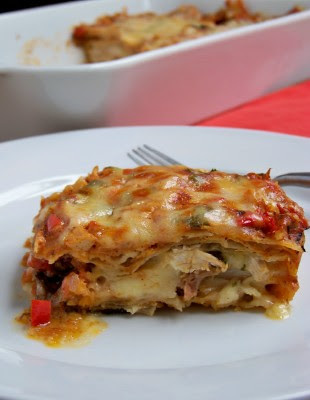 I came across a treasure trove of recipes out there for a Texas dish called King Ranch Casserole. It is basically layers of tortillas, chicken, cheese, and a sauce with--you guessed it, condensed cream of mushroom and chicken soup. However, I did come across of a few other recipes that actually made the sauce from scratch with butter, flour and broth. Now we are talking. So, with a few tweaks here and there I have come up with a definite crowd pleaser. I believe my husband's exact words were, "Don't forget about this one!" Bonus to the blog! The recipe is now published. Oh, and even though I made a casserole. The word still doesn't roll of my tongue well. 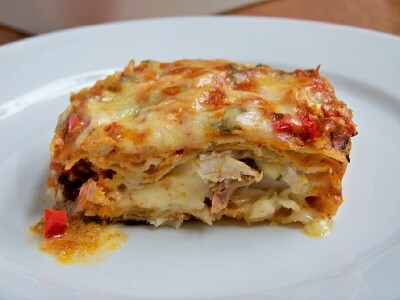 Maybe I should call it a Chicken Tortilla Bake or how about Chicken Tortilla Hot Dish (shout out to those in Minnesota)! We enjoyed this with a side of stewed black beans and a simple salad. Butter the sides and bottom of a 3 qt (9x13) baking dish. Preheat the oven to 350º. In a large saucepan melt the butter over medium heat. Add the onions and peppers and cook until softened, about 10 minutes. Add the garlic and cook for another 2 minutes. Add the flour, chili powder, oregano, and cumin and cook for 1 minute. Add the chicken broth and stir to thicken the sauce. Reduce the heat to a simmer and add the milk and Ro-Tel. Cover the saucepan and simmer for 15-20 minutes stirring occasionally. Remove the pan from the heat and stir in the sour cream and the juice of 1/2 a lime. Season to taste with salt and pepper. Cut each tortilla in half for easy assembly in the baking pan. Ladle 1 cup of the sauce onto the bottom of the pan. Layer half the tortillas on top of the sauce cut sides facing out (a few will go in the center to cover any holes). Add half of the chicken, half of the remaining sauce, half of the cilantro and half of the grated cheese blend. Repeat the layering of tortillas, chicken, sauce, cilantro and finish with the remaining cheese. Cook uncovered for 30-45 minutes or until brown and bubbling. Let stand 10 minutes before serving. Serve with a good hot sauce like Cholulua. Enjoy! Source: Adapted from here and here, but if you are looking for the church basement version look here. I love clicking onto your site and seeing what new recipe you have posted for the day! Yes I was shocked that you made casserole, but i can't wait to try it! Sounds awesome, would it work without the chicken? Shawna- Absolutely. You can use any meat of your choice, like shrimp or pork. But, if you are looking for a vegetarian version, then I would substitute the meat with more vegetables, like sautéed zucchini,spinach, black beans, and/or corn. Thanks for the question. made this tonight for dinner...YUMMY! Thanks for sharing! I shared it on my blog's weekly menu and pointed people here to find it! Did you fry or baked your tortilla's before assembling the bake? Seems that they would get soggy. No? Making your fabulous dish right now! The tortillas are not baked or fried, but for a light smokey flavor you can warm them over a gas flame.